Here’s another song premiere from a great band who I’ve enjoyed in the past few years, Parachute. The single is entitled “Hearts Go Crazy” and it goes to digital retailers tomorrow after being delayed by a week for unknown reasons. 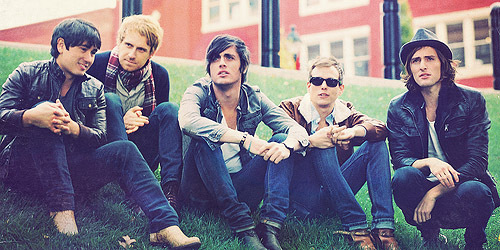 The band was originally known as Sparky’s Flaw before changing their name to Parachute, VA, though they quickly dropped the VA part and simply became Parachute. (The “VA” part is still visible on their first single cover; it’s highlighted in a blue color.) You may remember that the band’s first hit song, “She Is Love”, was originally featured in a Nivea commercial before it began climbing the charts, hitting #14 on the Hot AC survey during the summer of 2009. A followup single, “Under Control”, went top 30 on the same format and also got the Nivea treatment. It was then that they also dropped their first album, Losing Sleep, which hit #40 on the Billboard 200 thanks to some big placing on iTunes at the time. It landed them a spot of Kelly Clarkson‘s tour that same year and into the spring of 2010, where they also gained a worldwide following, particularly in Europe. Two years ago, the band released their second album, The Way It Was, which featured my favorite single by them to date, “Something To Believe In (Jeremiah)”. It spent three weeks at #1 on my personal chart and, again, hit that #14 spot on the Hot AC chart. “Kiss Me Slowly” followed that, hitting #20, and the band took a trip on the road again that summer with the Goo Goo Dolls and Michelle Branch. (They and Branch stopped by the station I work at around that time to perform mini acoustic sets; both were great. Branch was promoting a song “Loud Music”, which became a minor hit.) We haven’t heard much of them since, but lead singer Will Anderson has been performing some solo gigs as of recent, so it’s good to see the band back together and ready to introduce their new material. “Crazy” is a new sound for them, finding themselves on the verge of an art-pop sound reminiscent of the Gotye and Kimbra duet, “Somebody That I Used To Know”. (Listen to the DJ Mike D remix of it; that more closely resembles this song.) Yet, it’s brought back down by the more mainstream polished pop arrangements of bands like OneRepublic or even Panic! At The Disco‘s material from a few years back. Point is, it’s familiar, yet mysterious at the same time, and it provides a good balance. Their lyrics suffer for me a little bit in the quality department with their easy rhymes; both of their prior leadoff singles are stronger, especially “Believe”, but that’s not going to be what draws people in with this particular track. It’s good, but it’s a grower. Perhaps it’s a little bit more instant for you. Stream the song below and let me know what you think of it! I’m on Twitter at handle @AdamFSoybel. Stream “Hearts Go Crazy” on SoundCloud.